Following the Virginia Conference, I spent three days in the office catching up on work with the staff. I left Reagan Airport early Thursday morning for Atlanta, Georgia followed by a short drive to Stone Mountain where Melodye Brown, State Regent, had planned the Georgia State Conference. The Azaleas were budding, the weather was warm and the Georgia Daughters were welcoming and delightful to be with. My grandmother was raised in Jefferson, Georgia so it was fun to think of her and to anticipate researching when I get time. The 121st Georgia State Conference was held at the Evergreen Marriott Conference Resort at Stone Mountain, March 21-24. Time was built in on both ends of the conference so members and their families could enjoy the tranquil beauty of Stone Mountain Park and take advantage of its many amenities. 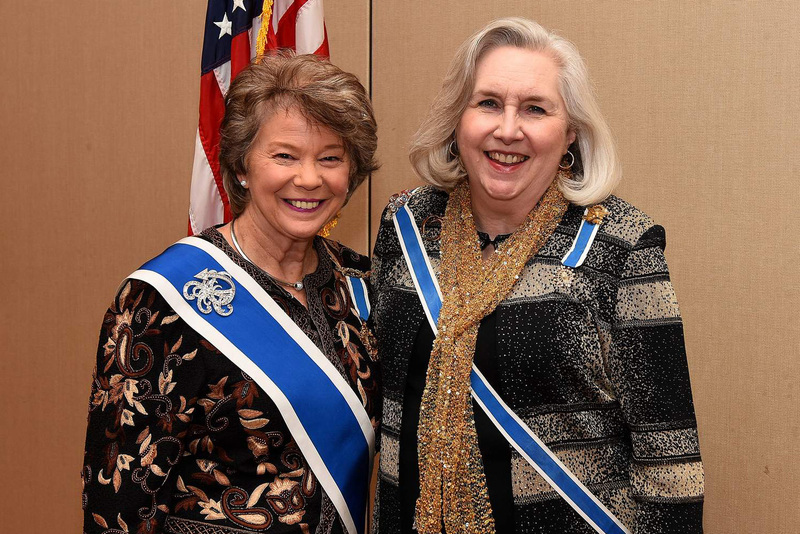 President General Ann Dillon had two other conferences scheduled for the weekend but graciously worked Georgia into her schedule on Thursday. After hosting a lovely reception in the afternoon, Mrs. Dillon was featured speaker at the Cameo Society dinner Thursday night. She was presented with a silver charm depicting a Georgia Peach as a memento of her visit. We were sad to say goodbye to the President General just as our conference was getting into full swing, but appreciate her extra effort to be with the Georgia Daughters. Friday morning, the Junior Club hosted a Welcome breakfast, a come-and-go continental buffet where members enjoyed mingling with friends, old and new. Later that morning, a beautiful Memorial Service was conducted in memory of our departed Daughters. Following luncheons hosted by the Chapter Regents Club and State Officers Club, an Idea Workshop featured many presenters sharing ideas for chapter projects which had been proven successful. The Idea Workshop ended with a DAR 101 session for new members. At our Opening Night banquet, we enjoyed a fascinating presentation by Dr. R. Scott Stephenson, President and CEO of the Museum of the American Revolution in Philadelphia, entitled “Making the Museum of the American Revolution,” and featuring the history of Washington’s camp tent. 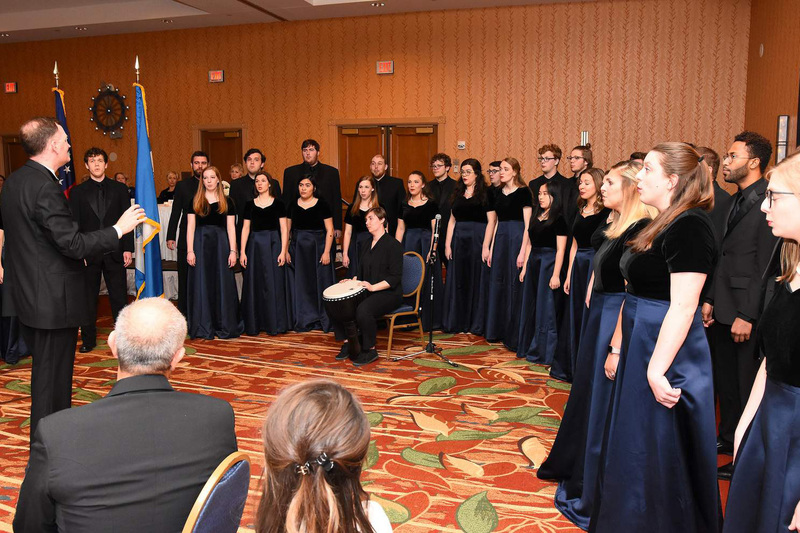 We were treated to a high energy musical performance by the Berry Singers, a 32 voice chorus conducted by Dr. Paul Neal, courtesy of Berry College. The Outstanding Veteran Volunteer Award was presented to Johnnie Shiver, who has also been named the Southeast Division Winner. To cap off the evening, Stephani Roohani was named Georgia’s State Outstanding Junior! 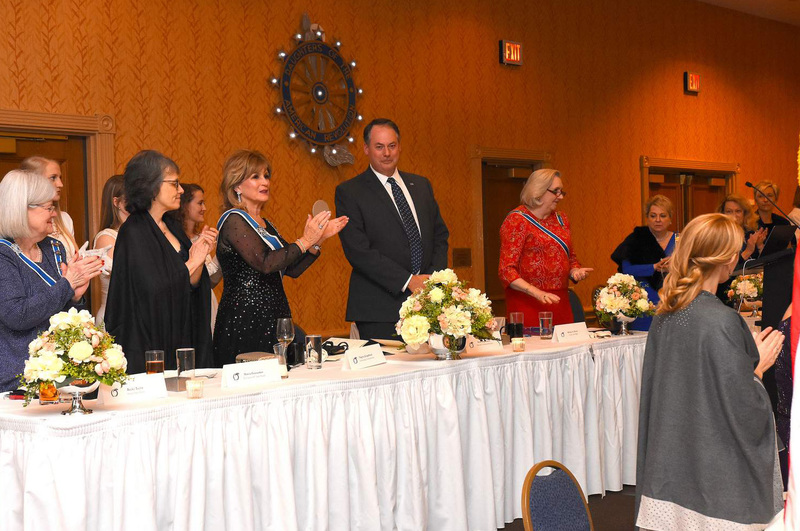 Saturday began with breakfast hosted by the State Chairman’s Club, followed by a Business Session in the morning where Officers and Chairs reported the year’s activities. Greetings were received from our State Guests: Marcia Guzauskas of DC, Carole Weiss of NC, Becky Taylor of OR, and Susan Holt of UT. 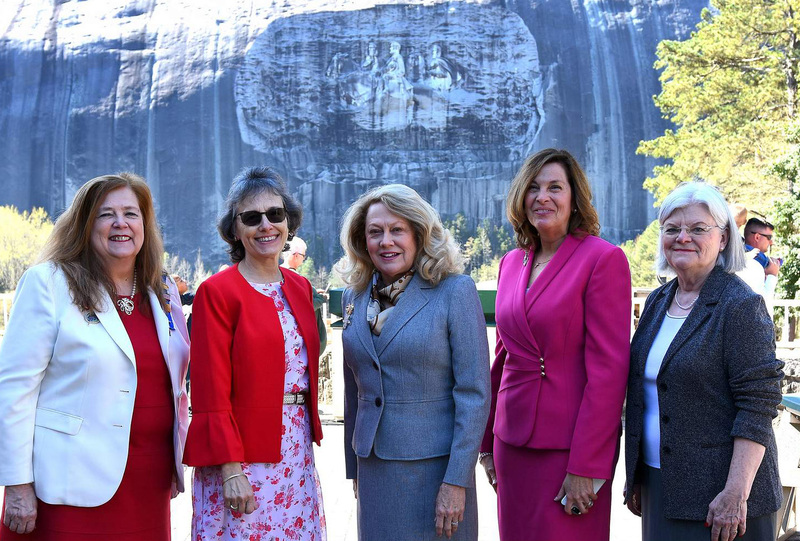 The visiting State Regents were then excused to enjoy a tour of Stone Mountain Park. Our visitors returned in time for our annual DAR School & Education Luncheon. This year we were pleased to have representatives from all six DAR approved Schools, including Hillside for the first time. Each school was presented with a donation for their important work. As one of our State Regent’s Projects, the Georgia State Society sponsored a Gate of Opportunity Scholarship at Berry College for 2018-2019, and will sponsor two Gate Scholars for 2019-2020. Our other State Regent’s Project is funding and execution of a multi-year historic restoration and preservation plan for “Meadow Garden.” This house museum was the farm home of George Walton, Signer of the Declaration of Independence, and is owned and operated by the Georgia State Society in Augusta. At our afternoon Business Session, delegates showed their commitment to the future of Georgia DAR, by approving a dues increase, the first since 2005. Our Awards Banquet on Saturday was an evening of recognition and celebration of our many DAR volunteers who make us successful. It was a fun evening with music provided by the Quadraphonics Quartet, and a humorous presentation by Julia Fowler, creator of YouTube’s Southern Women Channel. Ms. Fowler’s program was entitled “Embrace Your Southern,” and a signing of her book, “Talk Southern to Me” was held following the banquet.